In the world of professional Mixed Martial Arts, Nikki Lowe stands out as one of the few Native Americans competing in the sport today. A fighter inside and outside of the cage, she continually strives to maintain her cultural identity as a Chickasaw Native, and is now focused on healing her body and soul from the latest tragedy to emerge in her life. Mark Lewis is a tribal member of both the Gila River and Sac & Fox Nations. Already a professional photographer with over 15 years of experience, he has now transitioned his focus to filmmaking. Originally from Arizona, he currently resides in Santa Fe, New Mexico where he is a Cinematic Arts and Technology major at the Institute of American Indian Arts. In 2017, he branched out professionally as the owner of Fox Clan Productions LLC. PBS: During the film there’s a scene of Nikki Lowe sitting in a dark room with footage from a projector playing over her face. What was the artistic decision behind this? 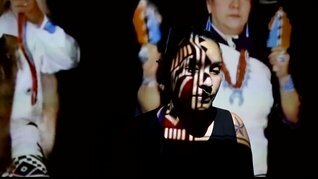 Mark Lewis: My decision was based on the hope that the dancers would represent a Native family in flux. My thought was that the audience would relate to these figures as a husband and wife or brother and sister. While shooting this scene I wanted to capture the projections as almost a form of war paint on Nikki’s body. Vision Maker Media develops, produces and distributes Native documentaries for public broadcast, in partnership with public television and radio. Vision Maker Media supports training to increase the number of American Indians and Alaska Natives producing quality public broadcasting programs, including advocacy efforts promoting increased control and use of information technologies and the policies to support this control by American Indians and Alaska Natives.